I will confess it up front. I love this book. Yes, it's long. It was originally published in three volumes in paperback, in the late 1980s. That made sense from a physical size point of view; it doesn't make sense in terms of the story. This is, like The Lord of the Rings, a long, single novel. It is, as another review commented, a murder mystery in which the mystery is never solved, and features a conspiracy which is partially but never completely explained. We don't get all the answers. That's part of what makes it the fascinating, complex book that it is. 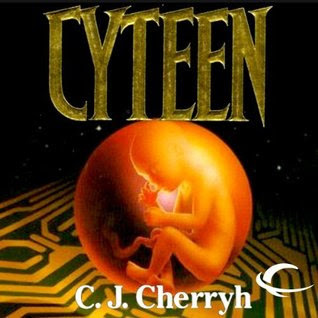 Ariane Emory is over a century old, a scientist, head of Reseune, the primary cloning facility on Cyteen, the primary planet of the political entity Union, in Cherryh's Union-Alliance universe. Union and Alliance have a lot of reasons for their conflict, but one of them is the azi, Reseune's clones. Along with being genetically designed to have certain aptitudes and traits, they are also tape-trained from birth to both educate and condition them to their intended roles. They don't have a normal range of free will, though neither are they anything close to automata. There's also internal conflict, both inside Union, and inside Reseune. We see Ariane Emory, or Ari, as very intelligent, very capable, with what may be good goals, but very, very Machiavellian. She's involved in a contest of will that in part involves another clone designer, Jordan Warrick, his cloned son Justin (a clone, but not an azi; Justin is a citizen), and Justin's azi companion, Grant. And then, quite suddenly, Ari is dead, and it appears to be murder, and of all the people who might have wanted her dead, Jordan Warrick is the one who was there. The bulk of this novel is about Ari II, a clone of Ariane Emory, initially a deep, deep secret. She's not just a clone, like Justin. She's intended to be a true recreation of Ariane Emory, with all her abilities and ruthlessness. It's not the plotters we identify with. It is, on the one hand, Justin and Grant, living under constant suspicion and surveillance, and on the other hand, Ari II, struggling to understand how she's being manipulated and why. As a young child, friends she has too much conflict with disappear, they and their families being transferred to distant locations like Fargone Station. Her Maman, Jane Stassen, gets transferred to Fargone without Ari, when she's barely preteen, for reasons that never make sense to her. Her uncles, Denis and Geraud Nye, major powers in Reseune, are her guardians--and Denis at least seems loving and kind, but even at this young age she knows there's more going on than she's being told. It's not clear how much the Nyes and their allies understood how determined and devious young Ari would be in looking for the answers. And along the way, Ari is introduced to the resources Ari I left behind for her, because Ari did plan this even if her death didn't happen as she anticipated, and we start to learn a great deal more about the original Ari, about Reseune, about Union, and about the Nyes. Ari II also starts to acquire friends and allies of her own. Everyone here is more complicated, layered, and conflicted than they appear at first glance. It's long, complicated, intricate, absorbing. Highly recommended, though I reluctantly concede that no, it's not for everyone. But, really, highly recommended.